Authenticity: of undisputed origin and not a copy; genuine. This word has been causing quite a stir within the social media & marketing world lately. I do mean that in the best way possible! It’s so much easier to genuinely connect with (individuals and brands) who are able to bring their true self to the table. No inhibitions and no-one to impress, just the real deal. There’s something incredibly refreshing about people who have the confidence to be authentic – especially online. It requires a level of vulnerability, transparency and integrity. All very valuable traits and, sometimes, incredibly hard to follow through. Keeping your thoughts, feelings and actions aligned is quite a task. This is now even more difficult as people have the ability to hide behind a keyboard. Social media is such a powerful tool. It allows us to connect with people that are scattered across the world and start conversations that may open doors we didn’t know existed. But, to truly reap the benefits of social networking, and all it has to offer, we must to do one thing. 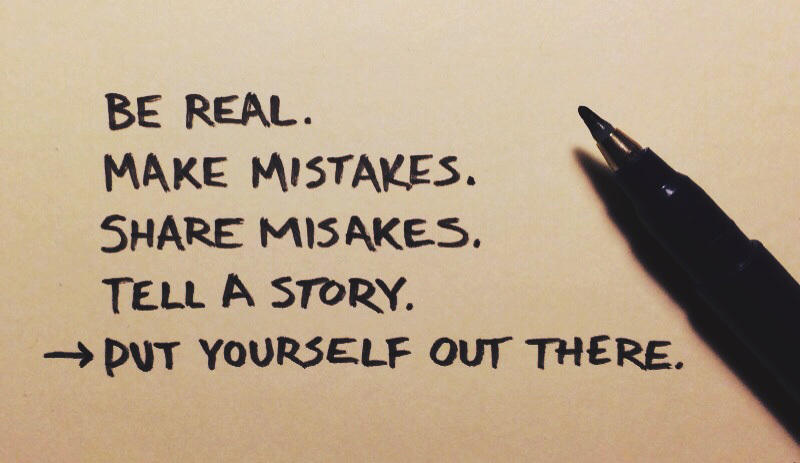 Be real. Sounds simple enough – yet so many people create a persona that is far from who they are in reality to try and fit in. It’s an easy trap to fall into but this can cause so many issues down the line. There are billions of people on earth but there is only one you. No one else has experienced, felt or perceived life the way that you have. So why rob the world of a fresh perspective by trying to be someone that you’re not? Self acceptance and appreciation is a beautiful thing. You can’t expect to build genuine relationships with people who have no idea who you are. Social media is a stepping stone to connecting with people who share your passions and interests. How do you reach these people? Make sure your online self is in alignment with who you are in real-time. What Happens When You Finally Meet Them? A few weeks ago, I had a quick video chat with a group of people I’d been listening to (and learning a great deal from!) online. One of the greatest things that I took from this conversation is that each, and every one, of them interacted with me in person as they always do on social media. There were no fictional characters. They are all 100% genuine. Let’s just reverse this situation. Imagine you’ve spent countless hours crafting a ‘perfect’ personality just fit into an online community. You’re the quiet, shy, introvert type but have given the impression that you’re boisterous and out there. It’s fine for the first few months because all of your interactions are limited to blogging, tweeting & writing. Then, someone wants to Skype chat about business or pick your brain about that great blog post. Now what happens? The visage will slowly begin to fall and that image you spent months building could pretty much turn to dust. Even worse, you leave that person with a pretty bad impression and risk damaging your personal brand. It pays to remember that consistency is key. 2) Changing personalities like a chameleon is certainly not a form of acceptance. In order to maximize from social networking & connect with the right people, you have to just ‘do you’. If you’re living a double life and hoping to forever hide behind Twitter – is this community really full of people that you want to work with in the future? Great businesses are founded on more than a group of people with a good idea. The best, the businesses that thrive & breathe success, at the heart have a culture based on values that all of those people share.